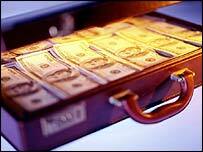 The Assets Recovery Agency has frozen £6m of assets from 20 criminals in its first 100 days of operation. The agency, set up at the end of February to confiscate the proceeds of crime, said this was an "excellent" start. It aims to freeze at least £10m by the end of this financial year, it said. ARA director Jane Earl said the agency was concerned not only with the Mr Bigs of the criminal world, but also smaller-scale, local villains. She said: "We are also interested in those medium-sized criminals - the people who cause major disruption to individuals across the country. "They may not have multi-million pounds worth of assets but what they have they use to make other peoples lives miserable." The agency said it hoped to have tackled 35 criminals by the end of the year, including at least four cases at the most serious level of organised, international crime. The 20 cases targeted so far are in London and involve drugs trafficking, money laundering or excise fraud. Of these, proceedings have started in four cases, and six freezing orders, one interim receiving order, and eight production orders have been obtained. Under a production order, the agency makes a court application to demand information. The value of the cases taken up in London was more than £8m and so far £6m was "under restraint", the agency said. In Northern Ireland, the agency is pursuing 11 cases worth £2.5m, with assets worth £95,000 frozen so far. Under the Proceeds of Crime Act, the ARA has the power to apply in the High Court to seize criminal assets even if the owner has not been convicted of a crime. The agency only has to convince the court that someone is enjoying a lifestyle which they cannot possibly have earned legally. A judge can then order their possessions to be confiscated and sold. The assets the agency is targeting include houses, cars, personalised number plates, jewellery, yachts and businesses.